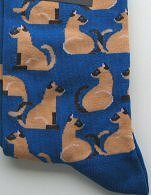 These bright blue socks feature only Siamese cats. These cat ankle socks are made of 56% nylon, 41% cotton, 2% spandex and 1% rubber. Fit shoe size 4 - 10 1/2 (women's sock size 9 - 11).